I was 37 weeks pregnant with my son when I started bleeding. I had finished a long day in the ER and was home with my husband, who was putting together the crib. I went to the bathroom and saw blood in the toilet. At first, I honestly wasn’t sure what to do. There was no pain, and everything else had been going well that day. But I quickly realized that bleeding while pregnant, especially this far along, wasn’t normal. I called my doctor and we were instructed to go to the hospital. We thought we would be going home after a few hours, but the baby continued to have a very high heart rate and an ultrasound didn’t tell us much so we were told I needed to stay the night on monitors. There was no room in labor and delivery, so we were stuck in a small back closet area. My husband was in what appeared to be an uncomfortable chair. Fortunately, I didn’t continue to bleed, but JP’s heart rate remained above 200 during the night. In the morning, we were counseled by the maternal fetal medicine physicians (the high risk OBGYNs) and I was transferred in an ambulance to the main hospital which had a level IV NICU. The doctor informed me I was not going home without a baby. This was unexpected, as I hadn’t even packed a bag! I also had over 10 shifts left until I was ‘supposed’ to deliver, so I felt totally unprepared. I felt alone and without an advocate. Initially, we tried to have JP vaginally, but I did not progress. After about 48 hours of pitocin, balloon dilators, and hoping that things would move along, unfortunately they did not. I realized that in my own life, I have definitely come to the hospital to just work my 8 hours, to care for patients, but in a much more sterilized way. Sometimes life gets the best of me, and in those moments I struggle with hearing my patients, trying to do the best and what is right for them, and making sure compassion enters each of my interactions. As a patient, it finally clicked. I realized sitting in a hospital bed that my patients invariably know where my head is at based on how I treat them, whether I sit, whether I look them in the eye, whether I talk to them in layman’s terms, whether they felt I was listening. I recently read a book that put all of these thoughts I was having into words, In Shock, by Rana Awdish, a female physician who herself has had multiple harrowing experiences as a patient. She currently works in critical care, and with her writing has been changing the conversation about how we as physicians care for our patients. After my experience, and reading this book, I came to the conclusion that I need to make it a point to do better. We as physicians need to do better. This last week #Doctorsaredickheads was trending on Twitter. It was very interesting to see patients describe their terrible experiences, but also fascinating to see physicians responding. There was a lot of anger over the fact this was trending, physicians defending themselves and our profession, rejecting the words, rejecting the notion that this phrase, albiet crass, could apply to any one of us at any given time. 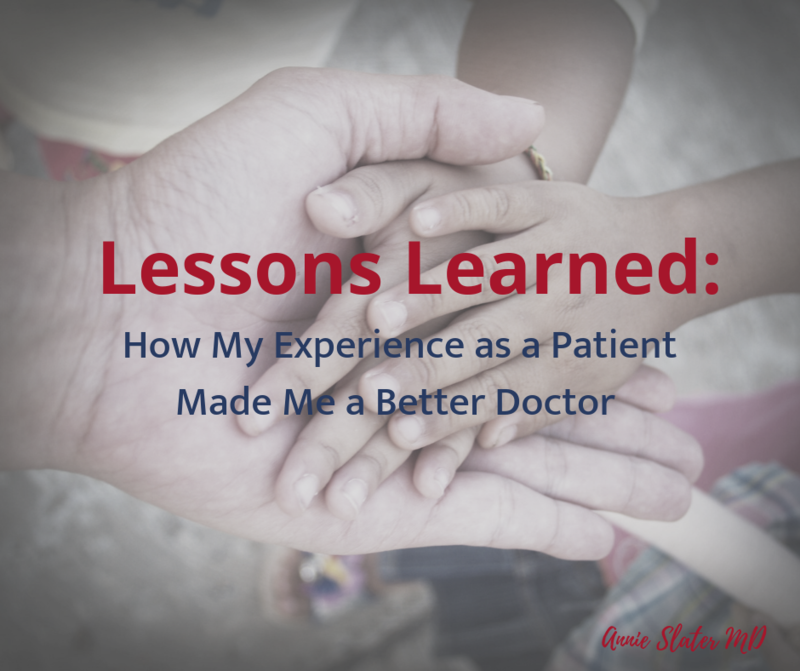 I learned so much from being a patient. I’ll tell my full story at a later date, but since my experience, it has forever changed the way I come to work. I know that every family can tell if I am mentally there or not. They know if I am there to take care of their child, or if I am just punching the clock. Every family in the emergency department needs and wants to be heard, and navigating the system can be really challenging. Sometimes the only option a family has is to come to the ER, because it feels as if no one else is listening. It is my responsibility to then become the one that does listen. Prior to every shift I make a true and concerted effort to leave my ego at the door. The work that I do is not about me, it is about trying to make sure that each of my patients get exactly what they need. Sometimes that is complicated care, sometimes it is to listen and create a plan to move forward. I want every family to know that it is my job to take care of their child, so I will do my best to do that very thing. I also have learned that often, a parent knows way more than I do, and it always helps me to listen and to take their perspective into serious consideration. I understand why we as a profession get the reputation we do, but don’t think it is because we don’t care, it is because we are still just people, with our own challenges and lives and families. Sometimes the things outside of our control affect us more than we would like them to. Sometimes we forget how to be compassionate and to put our patients first. Do you have a story, of how you changed the way you practice based on an experience? Or as a patient you felt by the way a physician treated you? I’d love to hear it.